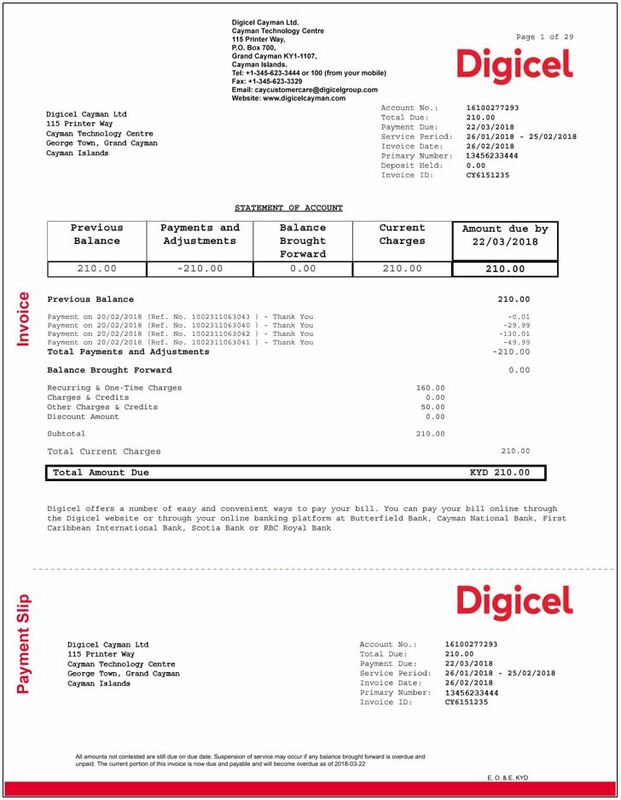 As a Postpaid customer, you pay your bill after you use the Digicel service. The following points will assist in understanding the features of your postpaid bill. To view and pay your bills in the My Digicel App, click here. To request a copy of your bill, please send an email to Cayman.CustomerCare@digicelgroup.com. Each Postpaid plan comes with an allotted data bundle. Even after the allotted data is used, data services is still accessible. The data used after the allotted data bundle is used, is charged at the prevailing overage rate of $0.10 per MB. If you are on a postpaid plan with Anywhere Voice Bundle, you are able to make calls to international calls to any number including the destinations below. You will incur additional international charges once your Anywhere Voice Bundle is depleted and you continue to make international calls, irrespective of where you are calling. * Anywhere minutes excludes Antarctica, Ascension, Cook Islands, Cuba, Falkland Islands, Guinea Bissau, Norfolk Islands, St Helena, Sao Tome and Principe, Solomon Islands, Vanuatu, Thuraya, Iridium & Inmarsat. If you are on an Unlimited Plan or a Digicel Red Plan all Digicel to local Digicel calls are unlimited. Calls made to any other network in Cayman will deplete the Anywhere minutes bundle. You will incur additional charges once your Anywhere Voice Bundle is depleted and you continue to make calls to other networks in Cayman. It is important to note that some transactions (Data charges and Credit U) do not take Credit Limit into consideration. For example, if your Credit Limit is $500, it is possible for this to be exceeded as a result of data charges or Credit U transactions. Once you are Roaming, you will incur charges for all outgoing transactions (calls, messages, data). If you are on a Roaming Plan, these rates will be reduced. Once the Roaming plan has expired, calls, text messages and data will revert to the standard roaming rates. These transactions will be shown on your next bill. If call divert is enabled on your device, ALL calls going to voicemail will be charged whether or not you are on a Roaming Plan.